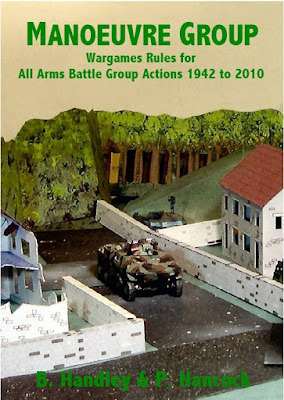 Manoeuvre Group - All Arms Ground Combat for the period 1942 to 2010 100 pages + markers and Quick Reference Sheet Recommended scales 10mm, 15mm, 20mmm 1/76, 1/72, 25mm, 28mm Level of detail 7/10 Complexity 5/10 Game length 2 to 4 hrs Die required D20 Manoeuvre Group is designed to fight all arms actions in the period from 1941 to at least 2010, using forces up to a Company Group (Battle Group in US terminology). That is, up to 8 tanks, 1 or 2 platoons of supporting infantry and their supporting close reconnaissance, engineering and artillery assets, in an evening. The innovative rule system means no book keeping At this scale the battles are fought at close quarters, in relatively dense terrain, be it urban or rural, from England to Iraq and all points in between. Manoeuvre Group's emphasis is just that, the command of manoeuvre units to eliminate the enemy. The reading of the ground, timing and employment of all arms assets are the key to winning a battle. The player will spend more time moving units about to exploit weaknesses in the enemy's plan than calculation of hit factors and dice rolling. The rules capture the ebb and flow of a battle often missing in other rules. With practise, experts (in tactics) can achieve 10 to 15 bounds in an evening even with a full Company Group. Table Of Contents: makes finding what you want quick and simple. Introduction Terrain: limitations imposed by terrain including a new, novel and above all simple but realistic simulation of dead ground. Commanding Infantry: Skirmishing, moving fast, going to ground, sneaking into position, assaulting a position. Commanding Vehicles: Move fast, slow and even very fast, Ram, take up positions Hull down, Turret down. Learn to fight as a unit, Shoot and scoot, smoke dischargers and more. Reconnaissance: How to find the enemy and how not to be found. Weapons Fire: Simple but comprehensive firing rules with realistic outcomes. Tanks can be damaged not just knocked out. Defensive Positions: What they are and the protection they give. Engineering: A realistic approach to combat engineering, booby traps, flame throwers, minefields, minefield clearance, moving heavy gear, towing and more. Building Your Command: Organisation building, weapons tables and sample organisations. Introduction To Warfighting: A guide to how to fight your command. Use of turret down and hull down positions for tanks. How to fight in urban areas. Scenarios: A set of scenarios and advice on how to fight them to get you started. The rules have been released with a free set of plans to make simple terrain to help in setting up the scenarios and stores flat afterwards. Comprehensive set of markers and Quick Reference sheet to get you started.